Champ offers simplified control with less keys, larger text, and no mode switching ever needed. 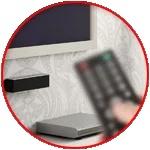 Be sure to point the remote at your TV during setup. Be sure to aim your remote at the TV during setup. 4. Release the key when the TV turns off and setup is complete.